The Mexican Riviera - from eclectic food, to stunning scenery, to a vivacious culture. Mexico is an incredibly diverse and unique destination. Seeing Mexico from a cruise ship is beautiful in its own right, but experiencing it by land on a Mexican Riviera shore excursion tour can be a once in a lifetime experience. At Shore Excursions Group, we make it easy to find exceptional cruise excursion trips in the Mexican Riviera, providing our customers with the best of Mexico. On one of our Acapulco shore excursions, marvel at cliff divers leaping from over 100 feet above the ocean, travel to Coyuca Lagoon for breathtaking views, or participate in an authentic Mexican cooking class. Looking for Cabo San Lucas shore excursions? Enjoy a cruise to the majestic rock arches of El Arco, ride a horse along the pristine coast, or take a thrilling ATV ride through rolling terrain. On one of our Puerto Vallarta shore excursion adventures, you can swim with dolphins, enjoy a cruise excursion with dinner and an entertaining show, or take a cruise tour of the culturally rich city. Shore Excursions Group offers more than 40 Mexican Riviera shore excursions. 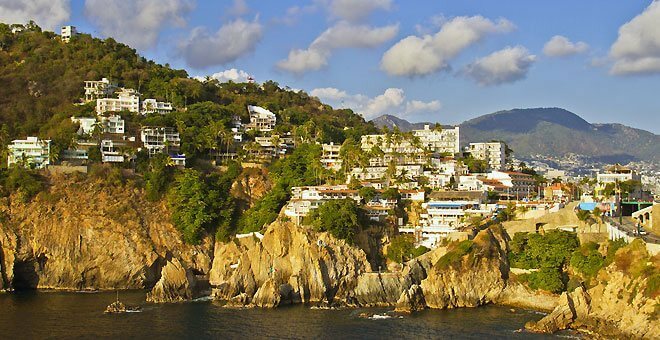 Click on a port above to begin exploring Mexican Riviera shore excursions. Paradise and lifelong memories await! "This is the same excursion with one of the ship offers, but in better price!" "Fun and Beautiful!! Bonus... breaching whales!!!" "The boat ride out and back was FABULOUS! I was very pleased that when we saw a mom and baby whale the captain stopped close by them so we could watch them play and even saw a few full breaches. That is an experience I will never forget! The place we stopped on golden coast to snorkel was breathtakingly beautiful! I was disappointed that we couldn't go lay out on that beach. From the way it was worded in the excursion description I thought we would be able to. The snorkeling was ok but I have been snorkeling and diving in much clearer waters so I was not amazed by that. If it is your first time I think you will enjoy seeing all the cool fish. It could be the time of year or just that a lot of sand gets stirred up in that area. I hope it is not always that murky. The crew was fun and VERY attentive. They always wanted to make sure you had enough to drink. The lunch was ok. Nothing special but it was nice to have a little something to eat while we were on the boat. I would definitely recommend this excursion to others. It was a great value and a fun day overall!" "Excellent fun and educational tour." "Excellent tour. Loved watching the sea lions. Several jumped on the back ledge of fishing boats and rode into the harbor with the boat while the fisherman fed them! This was very unexpected. The rock formations and water was beautiful. Highly recommend this tour." "This is a great package for adventurers." "Zip lining was for the thrill. This course was more of a challenge than I expected. However the staff was well trained and encouraging." "The trip was more than I expected and I loved it." "We really enjoyed walking aroud, taking in the views and learning something about the Island. We look forward to staying on the Island next time for a couple of nights and maybe doing the golf cart tour." "Almost didn't even do I tour here but glad I did. And pleased it wasn't cancelled since there were only two of us. Took us up top the cliff for view down; over to the high-end resort area just to see fancy hotels; then into the small old-town square where we went to the same shops the rest of cruise passengers were it. We were shown how the rugs were woven, dyed, etc. No real pressure to buy however. Then to mescal, mole, coffee shop for tasting. We still didn't buy anything. We are not shoppers. But it was all interesting to see. I'm sure we were a disappointment to the driver and shop owners. But we saw more of the area than if we had just gotten off the ship and wandered around on our own. So that was good." "The guide was great, he held the Van up while I went back a bought a ring, He made a stop for another person that was not scheduled so she could but a T shirt"
"Full of insights into the real Mexican past and present"
"Great small group experience with lots of local stops included between the 3 main towns." "Our guide was very knowledgeable. He spoke English well so there were no difficulties understanding him. The ruins themselves were very interesting. There is a lot more to see than just the main pyramid in the promotional photos." "We got there early enough that we were able to get a beach chair in the pool area. It became to get a little more crowded later, but it didn't bother me in the least." "Variety of activities at a reasonable price." "The glass bottom boat is quite small and the water is choppy, so if you're subject to motion sickness, go prepared." "We really enjoyed this tour!" "Appreciated the small group, the knowledgeable guide, and the variety of places that we visited. There were 6 people in our group of various ages and we all enjoyed this tour very much!"